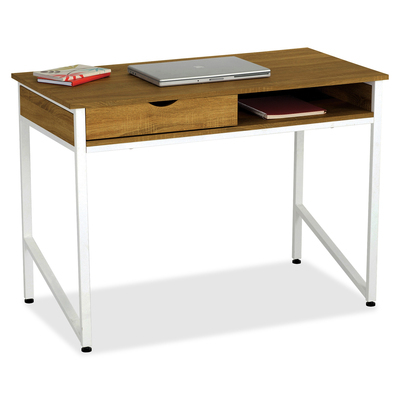 Efficient Office Desk Features One Drawer And Unlimited Possibilities. With Its Contemporary Styling, Storage And Emphasis On Streamlined Functionality, This Desk Will Be Right At Home In Virtually Any Office. Durable Design Features A Laminate Top, Powder-Coated White Steel Frame And Contemporary Legs. The Desk Offers One Drawer That Easily Slides Open And A Built-In Storage Compartment. More From The Manufacturer.